Fuji Speedway, Honjo Circuit, Nikko Circuit and it was a blast to have such talented drivers in our cars. Each of them shined throughout the 3 track days and performed incredibly well, adapting to each of the cars like seasoned professionals. “For years on end I’ve been trying to plan a Japan Drift Trip with mates. The idea is simple. Buy track cars, fly over, have a week drifting at different tracks, put them in storage and head back home. I realised thats far far easier said, than done. From a foreigners perspective, when you think track drifting in japan, Ebisu Circuit immediately comes to mind. The tracks in Japan are very distant from each other, so it becomes a struggle to transport cars (and the group) to and from cost effectively. Which is why foreigners generally go Ebisu Circuit, with the benefit of different courses and car storage on one site. My Japan Fantasy was to drift several different circuits whilst getting as much seat time as possible. Alongside that was to see cars, tuning shops and landmarks that you dream of heading to whilst visiting Japan. This is why I signed up to the No Doubt Drift Tour in January. Everything is taken care of as it’s a tour, and it ticked all the boxes for what I wanted to accomplish and more. So a bunch of likeminded drifters and myself headed over to Japan for 16 days. Drifting Fuji Speedway, Honjo Circuit and Nikko Circuit. Between the group we had four built track cars to share, ranging from 330 up to 500 odd horsepower. A minty fresh Nissan S15, a Sil80, a C34 Laurel and JZX100 Chaser. Also the professional instructors were on hand to give pointers if you wanted . We street drove these cars to the track, destroyed tyres all day, tandems galore then drove them home. The Silvia’s engine seized on track at Honjo Circuit Day 2, this was due to the incorrect oil filter being supplied night before, causing it to come off mid run and dumping all oil. If this was a personal car on a solo trip then it’s safe to say the trip would be over, and the car would be worth next to nothing. Thats a drifters worst nightmare when in Japan. In some cases I hear of people buying “turn key” drift cars in Japan, only to find they are far from it, needing days of repair with next to no track time gained. However being a rental car and maintained by a tuning shop in Japan. A replacement engine was found, installed and tuned the following day, ready for Nikko circuit. In which we competed in a drift comp and even got to do some grip racing in the drift cars, it was epic. 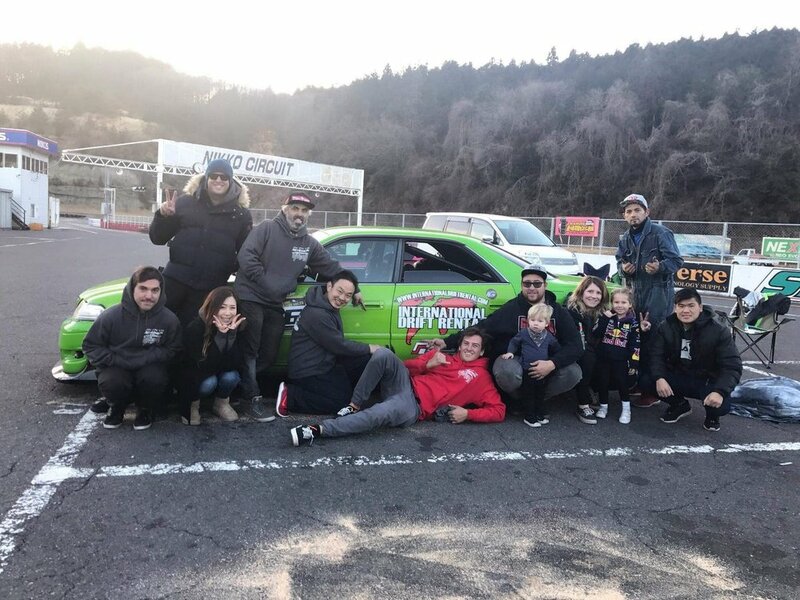 Between drift days we attended Tokyo Auto Salon, Tomei Shop Tour, probably 10 UpGarages, Car Yards, Go Karting, Mooneyes, BeeR, Nismo HQ, RunFree, explored Touge roads, Mt Hakone to name a few. It’s not all about cars though. We explored Tokyo whether it was sightseeing, embracing Japanese food or drinking beers from vending machines. All in all the trip was fantastic, my driving technique has improved immensely, met some amazing people and hanged with an awesome group of now to be mates. Sitting back, having everything catered for was by far the biggest benefit of the trip.